pilihan fans: No way, Louis belongs with Corinne! Do anda like her red fan atau her mint fan best? Is Aramina your favorit musketeer? Aramina is a character in barbie and The Three Musketeers. She is a maid and musketeer-in-training, and she is voiced oleh Willow Johnson.Aramina is one of the maids working at the kastil, castle in Paris; she secretly dreams of being a musketeer and is taught oleh Helene to improve her skills. Her fighting weapon is a fan in the movie.Aramina is the most romantic of the maids. She loves to dance ballet and daydream. 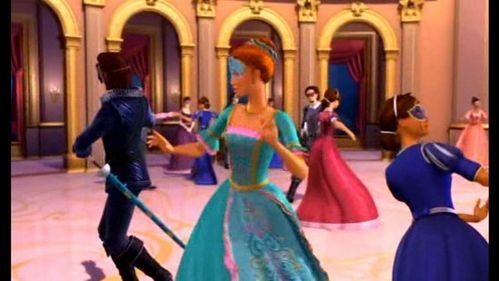 Her personality is similar to Princess Fallon, in barbie in The 12 Dancing Princesses. Aramina has light skin, green eyes, and red hair. She wears a seafoam green maid outfit and dress. a comment was made to the poll: Is Aramina your favorit musketeer? a comment was made to the poll: Do anda like her red fan atau her mint fan best?